The Samsung CLX-6200 is a multifunction laser printer with color printing, scanning, faxing and copying capabilities contained within one medium-sized business solution. A high monthly duty cycle and decent print speeds provide reliability, durability and consistent performance to suit any small or medium business need. Paper tray upgrades can increase this printer's output by three times to handle increased volume demands. Relatively low consumable costs help preserve office supply budgets and bottom lines. Other built-in convenience features provide ease of use and save time. 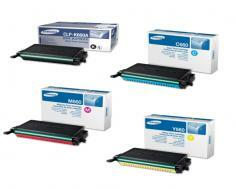 The Samsung CLX-6200 can achieve print speed of up to 21 pages per minute for both black and white and color. Maximum print resolution is 2,400 x 600 dots per inch, producing professional quality text documents and graphics. The monthly duty cycle is rated at 65,000 sheets, which can produce an average of 2,000 pages per day to fulfill increased demands without compromising print quality or the longevity of the print mechanism. An optical scanning resolution of 1,200 x 600 dots per inch can be enhanced to 4,800 x 4,800 dots per inch for paper reduction, providing a means to digitize office documents of all types and save them to network shared drives for future use. Documents can be scanned to USB, SMB, FTP, network and email, or can be transferred to hard copies at a rate of up to 20 pages per minute for both monochrome and color, at a maximum copying resolution of 1,200 x 1,200 dots per inch. First copy out times are less than 25 seconds for black and white and less than 28 seconds for color, reducing wait times for people who need to copy on the fly, whether it be one or more pages. Automatic duplexing capabilities can be used to print and copy two-sided documents conveniently and efficiency without having to manually load pages. 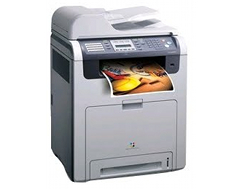 Additional copy features include ID card copy, clone copy, poster copy and n-up copy, which can transfer multiple documents to one output page to conserve toner and paper. An ITU-T G3 compatible fax module has a 33.6 Kbps modem that can transmit documents at less than 3 seconds per page, reducing long distance phone bills. 4 MB of fax memory can store hundreds of pages and additional features such as color fax and PC-fax expand the fax module's capabilities even further. Standard paper input capacity is 350 sheets of plain paper, divided between a 250 sheet cassette and a 100 sheet multipurpose tray. An additional 500 sheet cassette can be added, increasing the paper input capacity to a maximum of 850 pages. Media types that can be accommodated include plain paper, card stock, envelopes, bond and archive. 128 MB of printer memory comes standard and can be upgraded to 384 MB for increased network resource sharing and page storage capabilities. Standard connection interfaces that are built in include USB 2.0, 10/100Base-TX Ethernet and USB Host 2.0 with scan to USB and USB print functions. An upgrade to the Samsung CLX-6210 adds wireless network capabilities for connection to laptops and PDA's and an 80 GB hard drive for onboard document and print job storage. 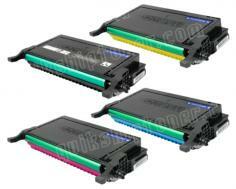 Although print speeds are average for printers of this type, They are on the low side for industrial grade devices. The print mechanism on this model is designed to provide durability more than speed. Standard and maximum paper input capacities are rather low for machines in this class, providing only one third to one half of the input capacity that industrial grade printers do. 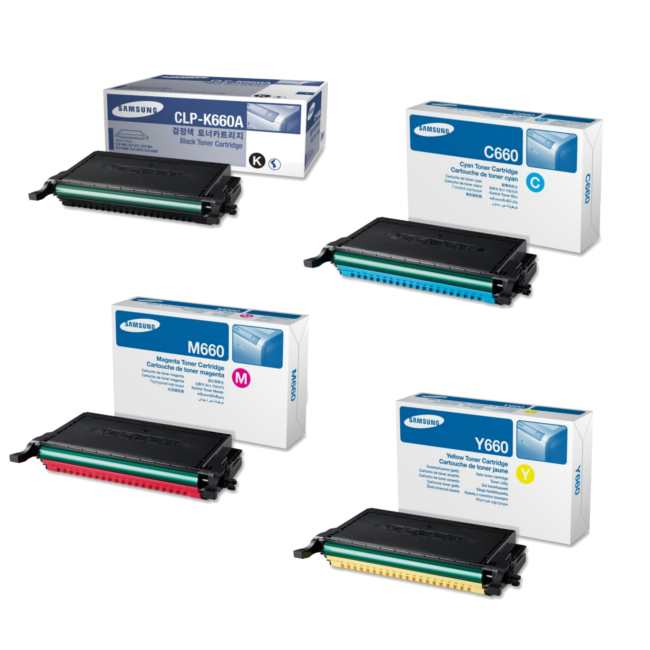 The Samsung CLX-6200 only has a maximum output capacity of 170 pages, which only allows for approximately 8 minutes of unattended printing, requiring unloading at least 12 times during a 2,000 page daily duty cycle. Review it: "Samsung CLX-6200FX "
The Samsung CLX-6200 ships with a black starter toner cartridge that has an average yield capacity of 2,500 pages and color toner cartridges (cyan, magenta and yellow) that have an average yield capacity of 2,000 pages. Replacement cartridges can be purchased in standard yield, which hold the same capacity as the starter kit or high yield, which includes a black cartridge with an average capacity of 5,500 pages and color cartridges with an average capacity of 5,000 pages.